Labour and delivery can place a significant amount of physical stress on a fetus and some fetuses will handle this stress better than others. During a contraction, it is normal for the blood flow to the fetus to be interrupted. While this is normal, some fetuses have a hard time dealing with the reduction in oxygen. In order to monitor the health of the fetus during labour and delivery, caregivers use various methods of fetal heart rate monitoring. In the case of an uncomplicated pregnancy, where the mother and fetus appear to be healthy, periodic fetal monitoring will be performed. The fetal heart rate is taken approximately once every five to fifteen minutes, depending on the stage of labour, using a Doppler device, which is the same device used to monitor fetal heart rate during prenatal appointments. Depending on the circumstances of the mother’s health or the pregnancy, continuous fetal monitoring may be recommended by the doctor or midwife. During continuous fetal monitoring, two sensors are placed on the mother’s abdomen. One sensor measures the fetal heart rate and the other measures the mother’s contractions. These two measurements are graphed side by side, allowing health care practitioners to determine how well the fetus is reacting to the contractions. The labour takes a long time to progress. 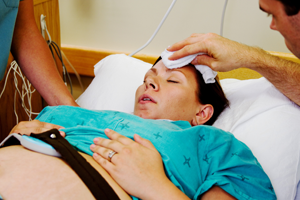 Continuous fetal monitoring is also performed if labour is induced or speeded up by administering a hormone such as oxytocin or if the mother receives an epidural. If the nurse or midwife identifies any problems using periodic monitoring during an otherwise uncomplicated labour, they will most likely switch to continuous fetal monitoring until they determine whether or not the fetus is in distress. Both methods of fetal monitoring can help ensure that your baby is born healthy and happy. If you have any concerns about the fetal monitoring that was performed during your labour and the delivery of your child, contact an experienced birth injury lawyer now.